Monarch Butterfly, photo ©Herman Giethoorn. 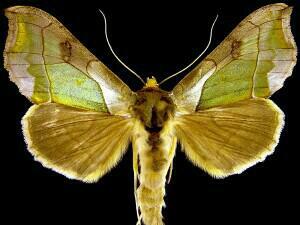 Hydrangea Sphinx Moth, photo ©David Arbour, North American Moth Photographers Group. A leaf or other organ that is not persistent, falling off after it has performed its normal function, often seasonally. Lying on the ground, but with the outer portion of the stem upright. With an axis that extends below a node (as with a wing extending from below a leaf along a stem). With two opposite organs at each node, alternating by 90 degrees at each successive node. Separating or splitting open at maturity, as in a capsule that opens to release seeds. With small, outward-pointing teeth; finely dentate. With few of a given structure (compare "congested"), or small-statured due to poor growing conditions. Growing to a fixed size, with the apex or apical portion developing first, then successively developing to the base. 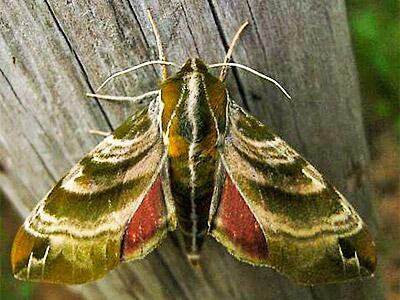 Green-patched Looper Moth, photo ©Jim Vargo, North American Moth Photographers Group. Interior branchlet tissue divided into many horizontal chambers by semi-flexible cross partitions. A special type of cyme that bears 3 flowers: a central, earlier-blooming flower and 2 lateral, later-developing flowers positioned opposite one another. A cyme bearing 3 flowers: a central, earlier-blooming one, and two later-developing flowers opposite each other. Perianth comprised of 2 series of parts, as in a cycle of sepals and/or petals. A flowering plant with embryos that produce two seed leaves (compare "monocotyledon" or "monocot"); dicotyledon. Referring to plants that bear staminate (pollen-bearing) flowers on one individual and carpellate (ovule-bearing) flowers on a separate individual. The tiny flowers located in the center of a composite flower head (Asteraceae). 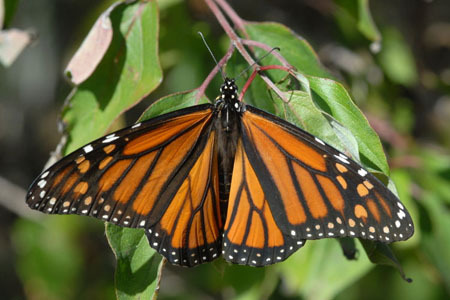 The mechanism by which a seed is transported from one place to another; dispersal agents in plants include wind, water, animals, insects, and gravity. Positioned at the end away from the point of attachment (compare with proximal). With leaves or stems growing on opposite sides of the stem in a two-dimensional plane. Not fused with another similar structure. With two locules (refers to an anther). Pertaining to or located on the back or outer surface of a structure, like a shark's dorsal fin. A margin with larger teeth with smaller teeth on them. A fleshy fruit with a firm inner ovary wall (endocarp) that encloses a single seed (i.e. a cherry); sometimes the endocarp encloses two or more, closely positioned seeds (called pyrenes).